You'll be £18.00 closer to your next £10.00 credit when you purchase British Cruisers. What's this? Gradually evolving from the masted steam frigates of the mid-nineteenth century, the first modern cruiser is not easy to define, but for the sake of this book the starting point is taken to be Iris and Mercury of 1875. They were the RN's first steel-built warships; were designed primarily to be steamed rather than sailed; and formed the basis of a line of succeeding cruiser classes. The story ends with the last armoured cruisers, which were succeeded by the first battlecruisers (originally called armoured cruisers), and with the last Third Class Cruisers (Topaze class), all conceived before 1906. Coverage, therefore, dovetails precisely with Friedman's previous book on British cruisers, although this one also includes the wartime experience of the earlier ships.rn The two central themes are cruisers for the fleet and cruisers for overseas operations, including (but not limited to) trade protection. The distant-waters aspect covers the belted cruisers, which were nearly capital ships, intended to deal with foreign second-class battleships in the Far East. The main enemies contemplated during this period were France and Russia, and the book includes British assessments of their strength and intentions, with judgements as to how accurate those assessments were.rn As would be expected of Friedman, the book is deeply researched, original in its analysis, and full of striking insights – another major contribution to the history of British warships. This superb book examines a period of Royal Navy ship design and operations which up till now has been under reported. It comes with the highest recommendation. The main glory of this beautiful book is the huge selection of photographs, many of which would otherwise have lain unseen in the NMM's encyclopaedic archives, elegantly combined with the text. This is another beautiful Seaforth naval history. The level of detail is immaculate and the ship drawings are well-executed. A classic reference work that is unlikely to be equalled – Most Highly Recommended. The book is very well illustrated, with a mix of excellent photographs and high quality purpose drawn plans. I would have liked at least one of the plans to be labelled but that’s only a minor quibble. This is a superb book that provides us with a detailed insight into the design and development of a key part of the British fleet at a time when the Royal Navy could validly claim to rule the seas. When you think of cruise ships, surely the Golden Age would have been between 1920 and 1950, the era of the Queen Mary and the Queen Elizabeth? It seems as though the Victorian age, responsible for so many monumental areas of progress, invention and development,also saw the birth and promotion of the cruise industry, with Britain at its forefront, as usual. A fascinating look at a truly golden era. As always, Norman Friedman has carried out extensive research into his subject and has a masterly grasp of detail. 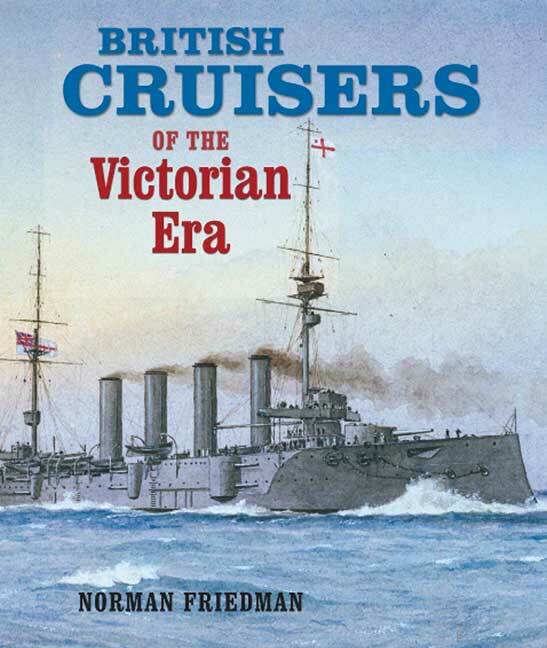 'Cruisers of the Victorian Era' contributes a great deal to our understanding of how warships evolved after the era of sail and is well up to the author's usual high standards. The book will be an essential acquisition for the collections in naval libraries, or course, but besides its obvious importance, it is also a thoroughly absorbing read and highly recommended for everyone with an interest in the generations of warships that preceded our own. An important book with a wealth of detail, which adds significantly to the published literature on this subject. This is a work of the first importance, one that turns the list of the Victorian navies' cruisers into coherent responses to policy and strategy inputs. If you're a fan of frigates and corvettes...you will find this book to be an excellent addition to your book collection. Well researched. A masterly grasp of detail. Lively and informative style. A thoroughly absorbing read. The strength of friedman's approach is that he ties the technological aspects of cruiser design (armour, armament, and machinery) to the Royal Navy's tactical and strategic doctrine. The first chapter of British Cruisers is a good introduction to the wooden steam cruising vessels before the coming of the ironclad. Friedman successfully melds technological development with the evolution of the Royal Navy's tactical and strategic doctrine to produce an integrated assessment of British cruiser design from the introduction of steam to the coming of the battecruiser eighty years later. These two volumes are big beautiful books printed on good quality paper with superb photographs and plans that are works of art. Yet they are much more than fine example of the printer's craft. It's a substantial large format book and to be honest I can't claim to have read it cover-to-cover yet, but even a cursory glance is enough to suggest that this one is probably up to NF's usual (impeccably high) standards. I believe Friedman's in depth research, the extensive (and superbly reproduced) photography selection, coupled with A D Baker's expert line drawings, will set a standard on this subject that may never be surpassed. PS, the publishers have given this book the 'Victorian Era' subtitle for some inexplicable reason, but don't be misled, because the magnificent 1901-1908 Armoured Cruiser classes of the Edwardian RN are also covered. Another superb book by Norman Friedman. It has eight chapters plus a lengthy introduction and an appendix on Vicker's cruisers. The book defines cruisers as those ships designed to protect trade and drive the trade of enemy nations from the seas. The book has over 350 pages including an index, and data pages listing the dimensions etc of the various classes and then data pages listing the fates of the individual ships. It is loaded with many pictures plus plans and profiles of selected ships. Following his magnificent book ‘British Cruisers – Two World Wars and after’ (and his two books on British destroyers from the earliest days to after the Second World War) this latest publication covers an era which is often forgotten. As usual, the books has many magnificent photographs and drawings (By A D Baker III) and is written in a manner that makes the passes of the complicated technical changes simple to follow. It is a very interesting and entertaining read which should not be missed.